Chickens are always good for a laugh. I mean, just watching them interact with each other is comical. Then they'll go and so something like sink to the ground and pretend to be a boneless chicken or give you that funny one eyed stare. I was able to capture a few pictures of them the other day that deserved to be shared. This is our mystery hen. 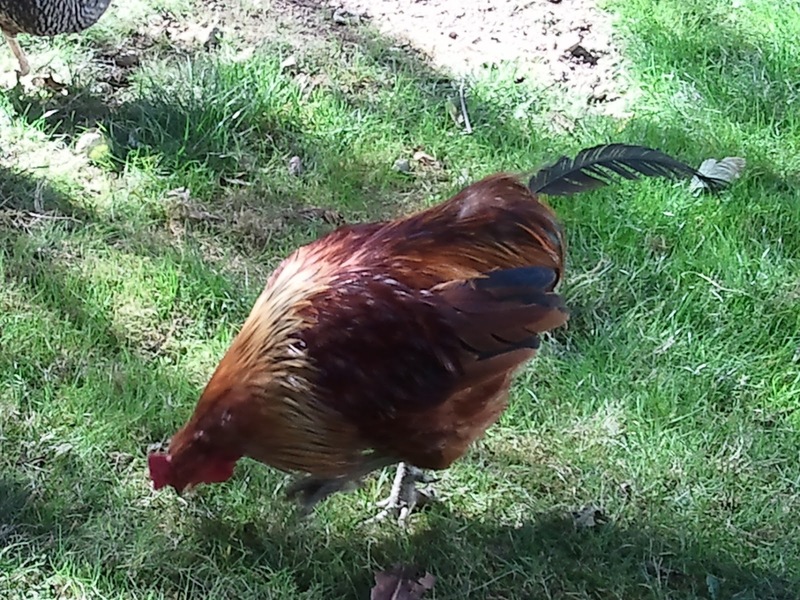 Neither Hubby nor I remember having this chicken in our flock before last week. 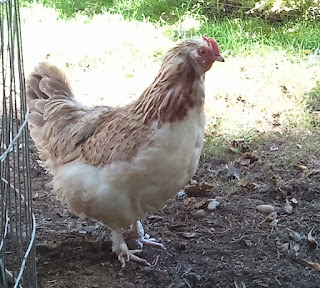 She's a pretty hen with nice markings and fuzzy feet. You'd think I'd remember her, but I don't. 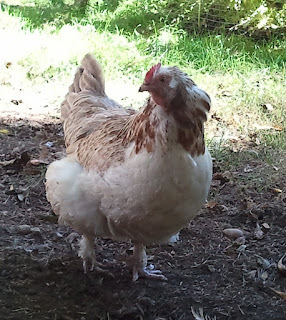 So is she a stray chicken someone decided we needed? 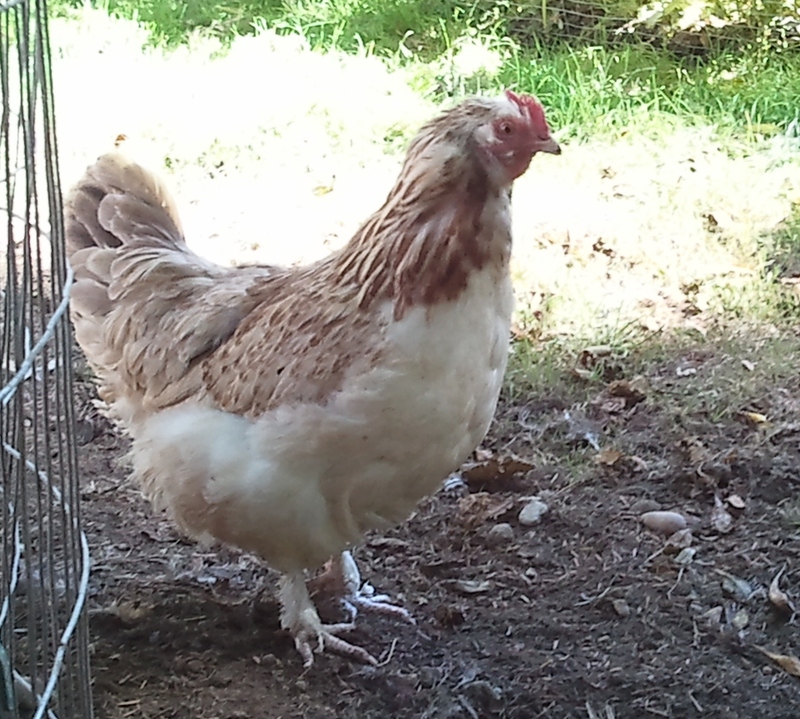 Is she an escapee from the neighbor's flock? Has she been hiding in the bushes for the last few months just to psych us out? The other hens don't seem to have any dominance issues with her, so she must be acting like the lowest rung hen or they remember her and we don't. It's a mystery. 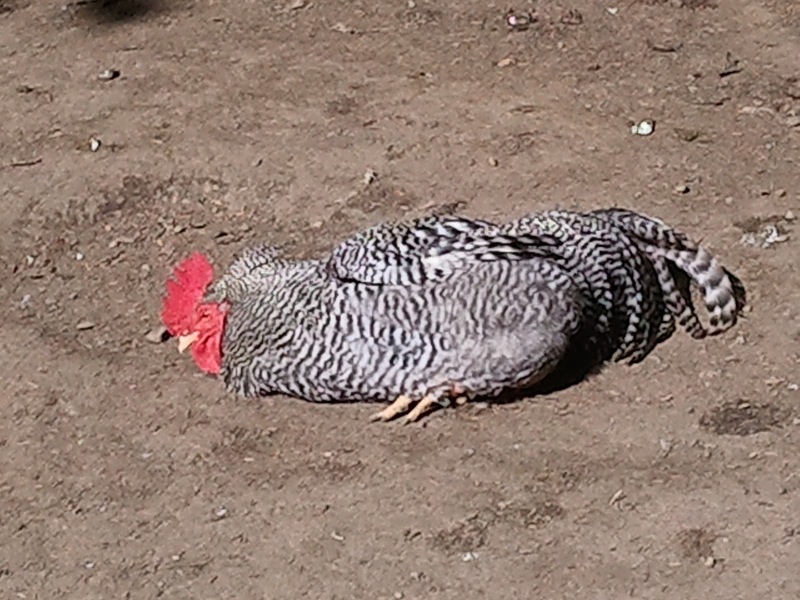 On sunny days the chickens flop themselves down on the ground and spread their wings like they are trying to soak up every drop of sunlight. 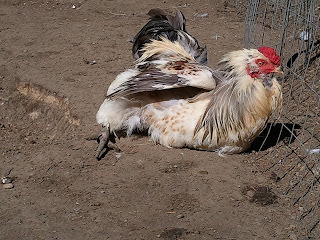 They usually try to lay on top of each other while doing this resulting in something that looks like a pile of boneless chickens. 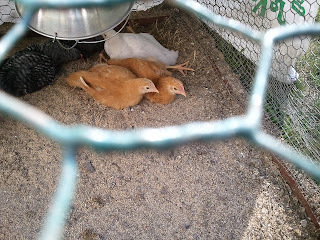 Even the chicks were boneless last week. 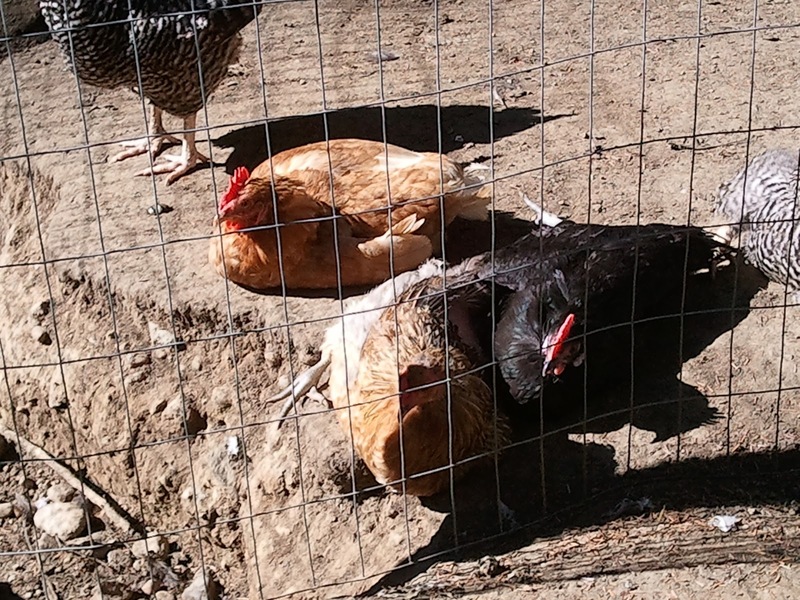 This is molting season where a good chunk of the older chickens lose a good chunk of their feathers and stop laying eggs. They really start to look raggedy after a while. Red is our oldest rooster. I think he's about 3 years old. This year he lost all of his gorgeous tail feathers during molt...except one. At least I think it was molt and not just getting hen-pecked. But either way, he's got this lone tail feather left that you just want to go pull out to get it over with. Poor Red. 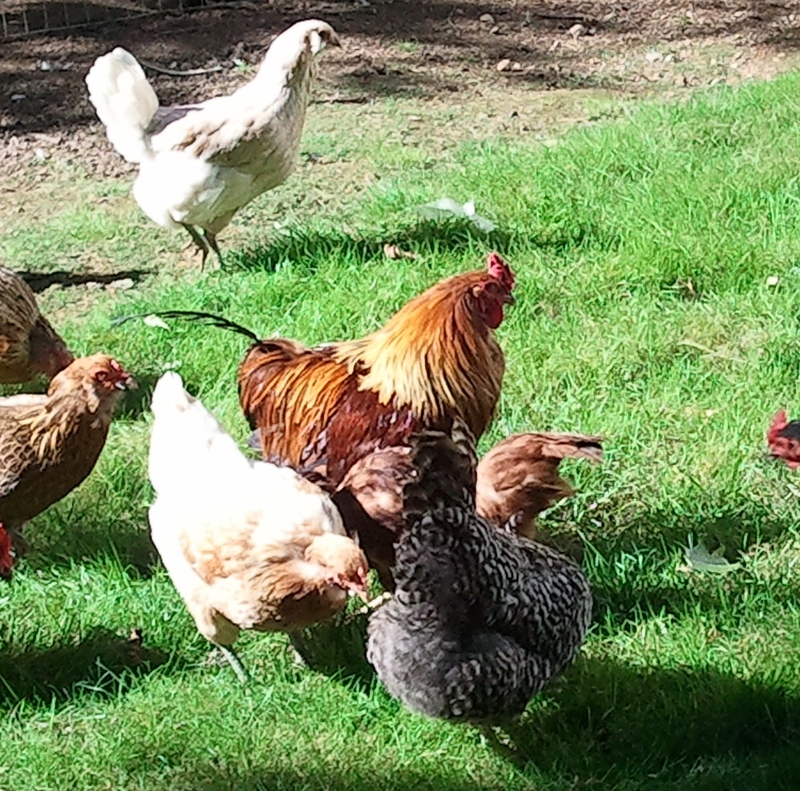 Although, he seems to still have plenty of girlfriends even without tailfeathers. haha. They straighten their wings along their back so their sides (that are usually under the wings) can get some sun.